This post is from contributing writer Bethany Wright. We made our transition to whole foods about six years ago. I really haven’t missed processed food too much … with the exception of Cool Whip. It’s pretty hard to beat the spontaneous beauty of opening up a tub of chilled whipped goodness where the fluffy contents are ready to float onto dessert like magic clouds. But no amount of delicious magic can cover up these scary ingredients: hydrogenated oil? trans fats? high fructose corn syrup? preservatives? Gag. cream, skim milk, sugar, stabilizers (mono- and di-glycerides), carrageenan, natural vanilla flavor, and nitrous oxide as a propellant. This sure beats the paragraph-list of canned whipped creams from other brands! Despite the fewer ingredients, I became wary of introducing nitrous oxide into my food — whether it’s a legitimate concern or not, who knows. Also, I cringed at the waste. One can barely lasted my family through two desserts. (I told you I liked my fluffy topping.) Plus, it’s expensive. So aerosol-based whipped cream was out. Sigh. But What About Homemade Whipped Cream?! Before I continue, I want you to know that I see you. Oh, yes. I see you waving your hand, dying to say, “But homemade whipped cream is sooooo easy to make!” You are absolutely correct. When my family spent a year being grain-and-sugar-free, we made our fair share of homemade whipped cream with honey and/or stevia (sorghum syrup or maple syrup would work too!). It’s easy, fun, and fast. Making your own homemade whipped cream from scratch is awesome. However, my life is brimming with a long list of easy and fast things I need to do. I make my own yogurt. I make my own bone broth. I grind my own flour and make my own bread. I use my own homemade deodorant and I make my own cleaning solutions… just to name a few. By themselves, each of these tasks are easy, fast, and totally worthwhile. Yet when life presses in and begins to overwhelm me, it’s the accumulation of the little things that suffocates me the most. Which means homemade whipped cream (and making dessert, in general) gets the boot. 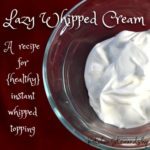 At this point, I had completely given up on having healthy, readily-accessible instant whipped topping in our home. Despite my meal planning efforts, desserts are definitely a last-minute thought in our home. If I take the foresight to actually make dessert, I usually default to our delicious Fail-Proof Fruit Custard. Yes, friends. I’m sad to admit it. I gave up on the Cool Whip dream… …until a recent dinner when my 5 year old asked me for some whipped cream on her roast beef. Huh?? We had a fun chuckle over her confusion, grabbed the tub of SOUR cream out of the fridge, and plopped some on her plate. And that’s when an idea was born. My kids continued to tell me how much they loved “whipped cream” on everything. I figured I could capitalize on this enthusiasm. So as an experiment, I gave my kids some strawberries with some plain sour cream. I kid you not, they actually cheered with excitement. Did you know that traditional whipped cream and sour cream both come from the same ingredient – heavy whipping cream? One is cultured (aka – soured) and the other is served fresh. In my mind, sour cream was a condiment that was supposed to be reserved only for savory dishes — like tacos, quesadillas, and pot roast. Could sour cream really become a sweet treat? In order to prove to myself that I wasn’t crazy, I drizzled some honey into a little bowl of sour cream and dipped in a strawberry. Words can’t describe my surprise. The texture … the taste … oh my goodness. It was like the perfect blend between whipped topping and cream cheese. Sour cream has now become our family’s secret dessert weapon. 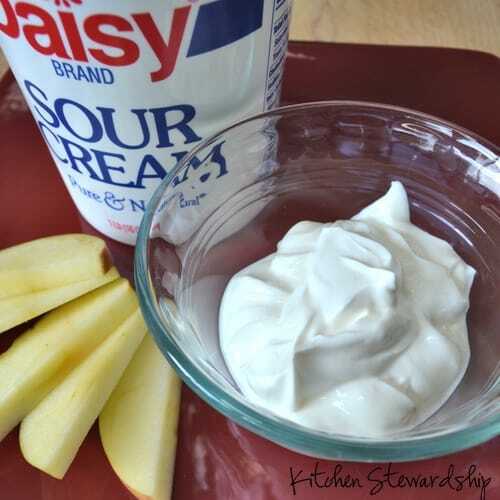 I’ve used honey-sweetened sour cream on pies, as a dip for apples, or as a garnish for fruit salad. Soooooo good. 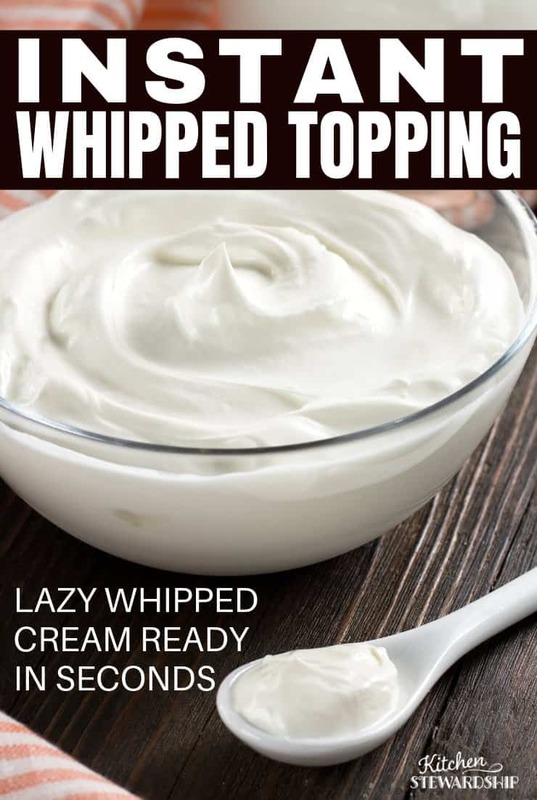 I love my “sour cream whip dip” for so many reasons …. Yeah. You might have noticed a theme there… 🙂 But a quick disclaimer: If you open up a tub of sour cream and expect it to taste just like Cool Whip, you may be disappointed. Depending on how dependent your taste buds are to sugar, you may need to sweeten the dip. We consume very little sugar as a family, so a tiny drizzle of honey does perfect for us – if we need it at all. Which Sour Cream To Use? While I love making my own yogurt, in this season of life, I am quite content to buy sour cream. But not all sour creams are created equal! Have you checked the label on some of these brands? The ingredients can be shocking! And organic doesn’t automatically mean it is better – some brands sneak in stabilizers and preservatives that aren’t necessary. Our favorite brand of sour cream is Daisy Sour Cream. It has ONE INGREDIENT. Yes, just one. Cream. While it may not be organic, pastured, or “fresh from the farm,” it’s hard to beat the beauty of one single ingredient! 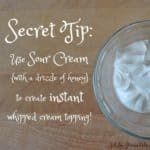 When you have sour cream on hand, this is an easy way to ‘cheat’! In a small bowl, combine sour cream and honey. Stir and serve! Making the Real Deal isn’t tricky at all! In a medium bowl, combine cream, sweetener, vanilla, and salt. Whip with a whisk or egg beater until peaks begin to form. Be careful! Watch closely once peaks begin to form. It is easy for peaks to become stiff and quickly turn into butter. Got any sour cream at home? What do you plan to serve Lazy Whipped Cream with? Tell us in the comments below! Disclosure: There are affiliate links in this post to Amazon, Vitacost and Tropical Traditions from which I will earn some commission if you make a purchase. See my full disclosure statement here. Next Post » Guess How Many Times This Pregnant Mama has Consumed that Orange Glucose Test Drink? Yippee!! What a great idea! We absolutely will try this. Especially since I have given up on “making” my own whipped cream. Seriously it doesn’t take 5 minutes to whip up heavy whipping cream. But…I’ve stopped because its single ingredient is no longer cream. 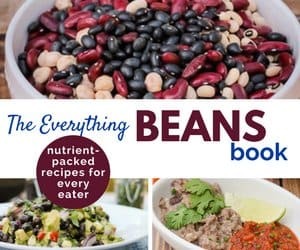 It contains a few extra ingredients, including…. Carrageenan!!! Why do I need a stabilizer for my cream? What’s up with putting additives in a pure whole food. Plus…it’s in the organic creams too. I’ve read that it’s not good for us and it may be a cancer causer. Ugh! I used to make lots of cream soups…but no more. And then there’s my pumpkin pie made with maple syrup….and heavy cream. No more that either! I’m going to check the sour cream….I wonder if I can make a cream soup with that? Probably not. Anyway…thanks so much for the sour cream suggestion! Using sour cream in soup is an ingenious idea. Oh, sour cream is wonderful to round of a soup instead of heavy cream. Do a little at a time and taste. Start out with a small amount and work your way up. The sour cream needs 34% fat or so in order for it to bra able to heat up to a boil without curdling. When I make “cream of” soups I just use whole milk and thicken with arrowroot, flour or cornstarch. I wouldn’t think they’d require full cream…? Yes, carrageenan is suspected of contributing to cancer, so definitely an ingredient to avoid. A teaspoon of cornstarch can also act as a stabilizer. Kathleen — Mmmmmm! Sounds delicious! This doesn’t taste bad…but definitely doesn’t taste like or have the same consistency of whipped cream. I hadn’t thought of using sour cream as a substitute for whipped cream. Great idea! Leanne – That’s fascinating to hear that sour cream is nothing “new” to other cultures. Mmmmmm. On crepes?? That sounds delicious! You can always try making crepes with coconut flour or almond flour if you are watching your grain intake. what a great post! Like you, I love me some fluffy goodness. WE also are mostly junk free and sugar free. We use Daisy sour cream a lot at our house on the savory dishes as well as the dessert ones. BUT there’s one more item you could use as whipped cream substitute. Coconut milk in a can. Shake the can and put it in the fridge for a couple of days! I have one there all the time. When you need whipped cream, take it out, whip it with some honey and serve. OR just stir it in the can and serve it. Either way works fine. Because coconut is a fruit, it’s sweeter than sour cream so no need to add sugar or sweetener! I do know some people that don’t like canned coconut milk because it has Guar Gum or another thing that is used as a preservative. But it’s an option. tereza – Oooooo. I like the idea of the coconut milk! I’m going to give that a try! Not every family member in our home likes coconut, but that sounds like a great quick option! I wholeheartedly agree with you that just one more easy, little thing can push a mama over the edge. Ever since I got my emulsion blender if we want a dollop of whip cream, I pour a bit of heavy cream in a mug and whip it and less than 30 seconds it can be served as a delightful addition to breakfast or a special drink as a treat. And since it doesn’t take long, my girls are willing to do it and I don’t have to! I do love the idea of sour cream as a dollop of goodness too! We love sour cream anyway, this is a great way to use more. We’ve tried making creme’ frache’ from raw milk (the raw milk version of sour cream) and it’s worked a few times, but sometimes it doesn’t thicken like we like our sour cream. Another creamy goodness treat is cottage cheese! I used to not like it, but since incorporating it like Katie does in scrambled eggs, we’ve been experimenting with that and fruit-again like the sour cream-not all cottage cheese is created equal! Just had to share this: as a pastry chef, we would make ice cream and sorbet from scratch. We made a sour cream ice cream to serve with blackberry pie. It was just sour cream and simple syrup! Wish I could remember the recipe for you…it was delicious! 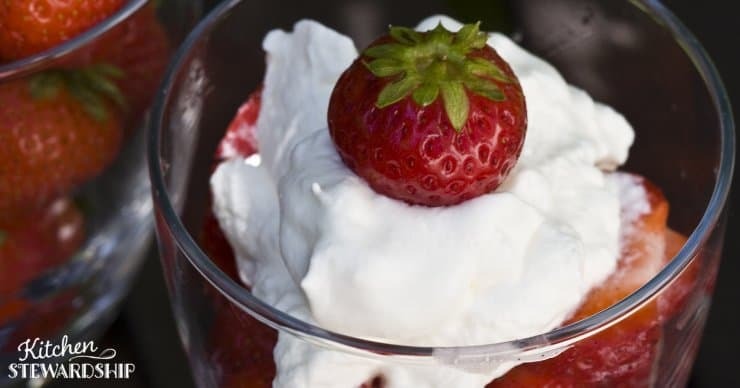 Try strawberries or blueberries or raspberries with just plain heavy whipped cream for dessert. You can have honey on if you need to. It is goood. My grandmother used to serve that for extra special dessert. At home we got frozen berries with plain milk on too. It was our favorite dessert and we would get.dessert every single day that way. 🙂 or a nice fruit in season. Just discovering your website after listening to Wellness Family Summit. We love plain greek yogurt on everything instead of sour cream. Yum. so delicious. AND COCONUT CREAM!!! Put in refrigerator to make it thick. Open carefully and separate the thick cream from the coconut ‘water’. You can whip it or just use it straight from the can as a yummy topping. Add maple syrup as a sweetener and it is sweet cream topping. Delicious and healthy. Oh yes, I do this with yogurt too and it’s great. Sour cream is so rich and decadent though 🙂 Have you ever tried to whip sour cream? Just wondering if it would work. I make my own sour cream and I love usingvit in my smoothies!!! My fav is almond milk, sour cream ( don’t skimp!!! ), blueberries, a banana and chia seeds! Yum!!! I make my own sour cream too. If you make your own yogurt ( not the heated type, the kind you leave out at room temp for 15 or so hours) You make it the same way you make yogurt. One tablespoon per one cup. If making yogurt you use milk, if making sour cream you use heavy cream. We are on GAPS and so commercial sour cream is out. We make our own though and love it. We’ve been using it as whipped cream with honey and vanilla and other add ins like cinnamon, cloves and nutmeg too. The first taste was obviously not whipped cream but as we continued to have it, we’ve come to prefer it over whipped cream. I think it’s that way with most ferments. At first they seem really sour but the more you eat them the more you become aware of the complex flavors and start really liking and craving that taste. Also we found that the less we ate of commercial products that have all sorts of hidden sugars/chemicals…. in them and the more we moved away from most sweeteners and grains, the less we wanted overly sweet tasting things that we had been used to. It almost seems like it was masking all the other flavors in the foods. Now we can taste what we had been missing and food tastes better than it ever did before. Who knew? I suppose all those companies that have been sneaking it into their products and making money off of our ignorance. Not any more! I’ve been looking for a substitute for cool whip for a while. It’s the last bad food I needto eleliminate. Sour ccream just might work. Thanks for the idea. of course sour cream works! we eat it as dip plain. we eat it on veggies instead of butter, on crepes or dutch apple baby with no sugar. ive dipped choc chip cookies into it for an added clean fat zing. it is the cleanest tasting, velvety-est tongue-gift there is. love me sum sour cream!! Oh Bethany, it’s too funny that I stumble upon your blog when hunting down Cool Whip alternatives. If I can’t get recipe ideas through you via India, I can still get Bethany-recipe ideas via the world wide web. Hope you and your family are well! Here’s just a thought/idea to make real whipped cream, really easy. Put the whipping cream in a jar (cold jar works best, I think) and sweetner, if you use it, and have your kids take turns vigorously shaking the jar! Easy whipped cream lol.. don’t let them shake it too long, or you’ll have butter instead of whipped cream. Is it possible to whip sour cream??? I love it sweetened, but if it’s just cultured cream it seems like it could be whipped to lighten it up and make it more fluffy??? This is a wonderful idea! I went to the store a couple of hours ago, and did not purchase the heavy cream. I was scanning the internet, and posting questions about how to finish my dessert without using the heavy cream, but with sour cream (which is in my refrigerator). When your info came up I was delighted! Thank you sooooo much.